This is an intense online training program about Python techniques for quantitative finance. By signing up to this program you get access to 120+ hours of live/recorded instruction, 5,000+ lines of Python code 30+ Jupyter Notebooks and a comprehensive online documentation Also have a look at the current 16 week study plan. The Certificate Program Brochure provides you with all relevant details about the program. The next Certificate Program starts in the week from 13. May 2019, is mostly self-paced and takes about 16 weeks to complete. Read the example 16 week study plan. Enroll to the Certificate Program and benefit from the unique combination of materials, topics and codes that are covered in this comprehensive online training program. The regular fee is 2,495 EUR (net of VAT if applicable) per person. Get in touch if you think you qualify for a discount (e.g. students, academics, upgrades from other TPQ classes/courses). Currently, our super early bird pricing is available for 1,999 EUR (= 2,378.81 EUR including VAT). This pricing is valid until 20. April 2019. 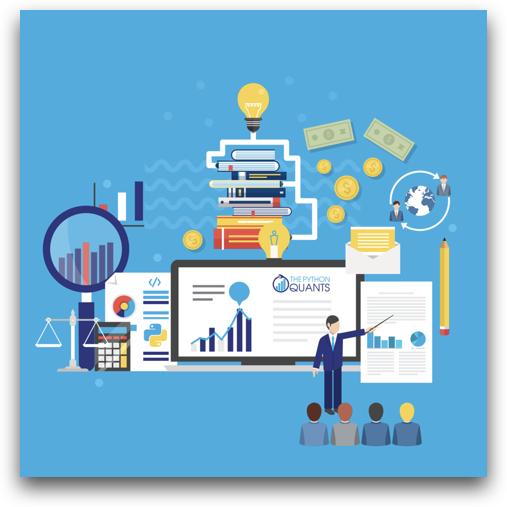 Login credentials to the Quant Platform are sent immediately afterwards, so you can get started with the course materials right away. Detailed joining instructions for the live sessions will be sent in time before they start. 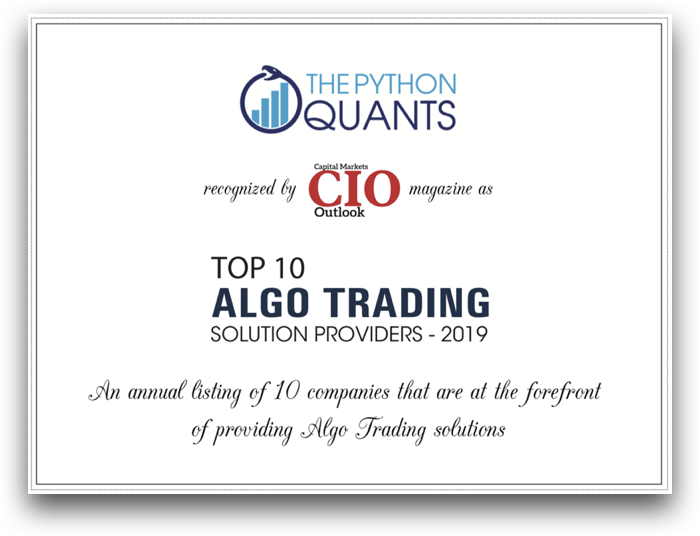 We are proud to be named Top 10 Algorithmic Trading Solution Provider of 2019 by Capital Markets CIO Outlook. 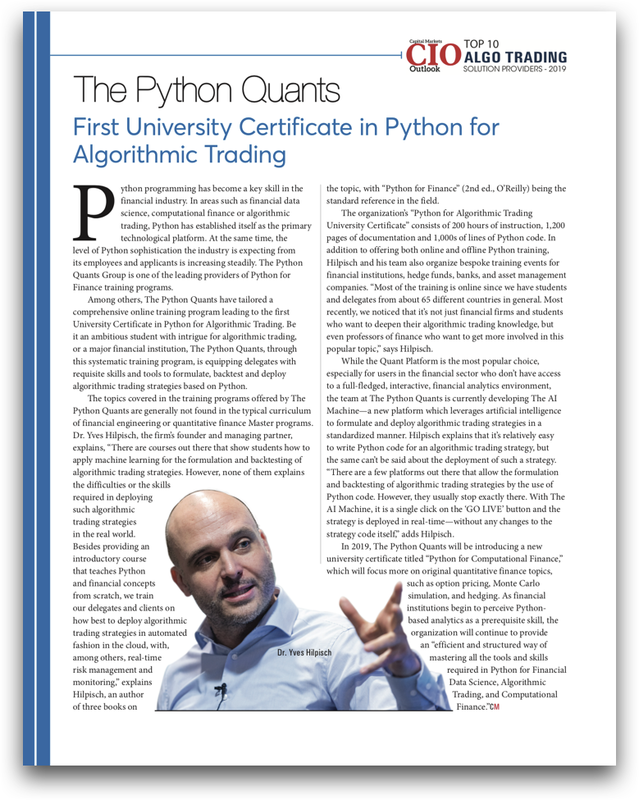 The Certificate Program in Python for Computational Finance is based on the same approach and core classes as our popular Certificate Program in Python for Algorithmic Trading. Here you can read the full article. In the following, you find answers to the most frequently asked questions about the program.